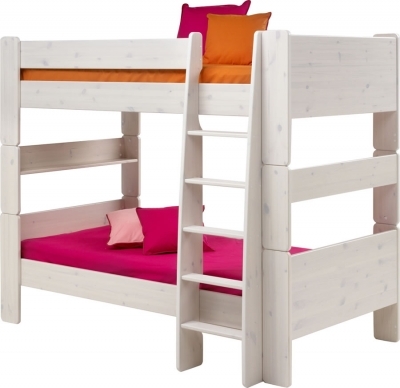 The Steens For Kids solid pine bunk bed in a whitewash finish can be separated into two single beds as your children grow and features a reversible step ladder. The five step ladder can be positioned to the front of the bunk beds on the right or left sides. There is enough clearance under the bottom bunk allowing for under bed storage to help keep your children's bedroom a little tidier. Extension kits can also be added or taken away from the Steens pine bunk beds as your children's needs change.